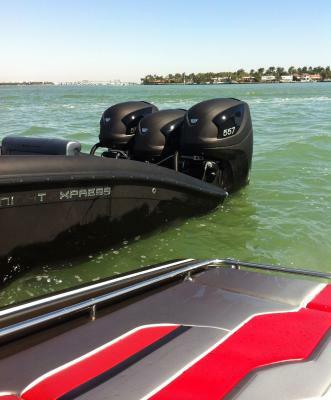 Seven marine in 2011 released the 557hp supercharged V8 outboard, this extraordinary power compressed into an outboard is raising the eyebrows and grabbing the attention of the industry. 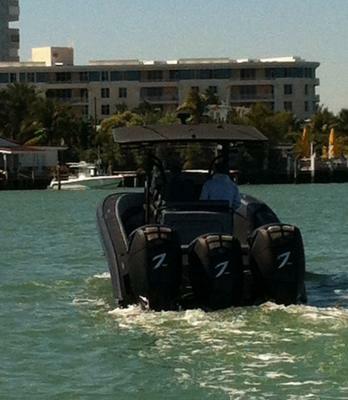 Recently in Biscayne Bay, Florida a rig fitted with triple Seven Marine 557’s roared past our friends from BOATING magazine. The Midnight Express powered by over 1,500hp is rumored to be capable of speeds in excess of 100mph. Midnight Express boats are renowned for their high performance, great sea handling capabilities and quality construction, coupled with these powerful supercharged engines launches the vessel into a new category of High Performance Centre Consoles, such vessels have typically averaged top speeds around 60mph – 70mph. The V8 Supercharged outboards produced by the Wisconsin-based Seven Marine is attacking outboard design with new concept using a Cadillac supercharged LSA aluminum V-8, mounted longitudinally. 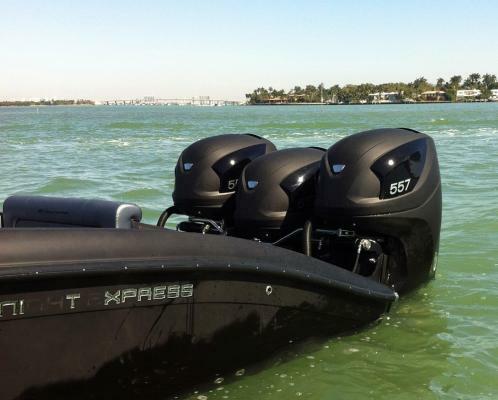 According to Seven Marine’s promotional literature, a pair of the 557 hp outboards can cruise at speeds where triples are running wide open, yielding better fuel economy, as well as the potential for even greater speeds. Seven Marine has incorporated the Cadillac CTS-V’s lightweight, all-aluminum, fuel-injected, supercharged LSA V8 and marinized it to harness the power into a compact marine outboard. 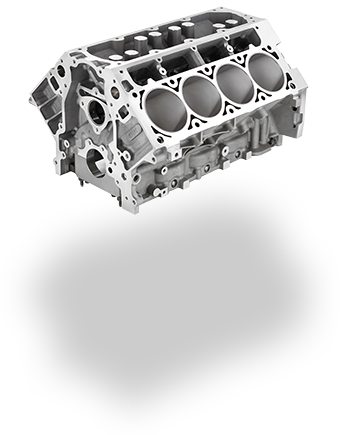 The 557 horsepower supercharged V8 delivers nearly 60% more power than any other outboard on the market. This allows boats to be rigged with fewer motors, decreasing weight and drag while increasing high-speed fuel economy and offering higher available top speeds. 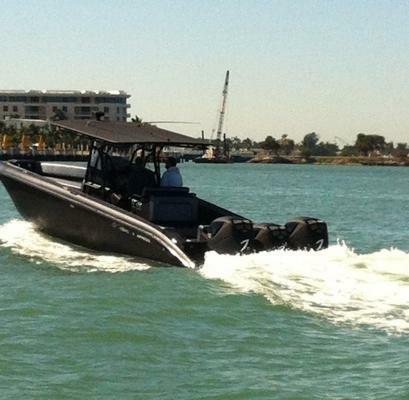 Closed-loop cooling, an ECU-controlled octane scaler, and dual 3.5″ exhaust are among the myriad technological advances Seven Marine has brought to the outboard market. Acronautic specializing in preparing and customizing exceptuional sport boats such as the Midnight Express, Fountain, Dariel and other high performance craft. If you require professional support to rig your vessel and ensure it is equipped with the best equipment suited to your particular application, contact us to discuss options and requirements.